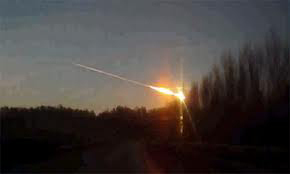 A meteor streaked across the sky above the Ural Mountains in Russia this morning, injuring more than 400 people, many hurt by broken glass, and causing explosions. Fragments of the meteor fell in a thinly populated area of the Chelyabinsk region, the Russian Emergency Ministry said in a statement. Separately an asteroid called 2012 DA14 is due to make the closest recorded pass by the earth today.